Everyone knows that holiday season means more sales. It also means more tire kickers and price hagglers. However, I have made Black Friday sales from new customers who never knew before then. How did I do this? 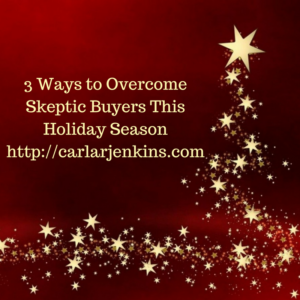 Here are my 3 ways to make this holiday season merry and bright! New customers are going to be pessimistic initially before they have never met or done business with you. The way towards removing any objection is to create the know, like and trust factor. If they are on your page, they know and like what you have to offer. The last step is trust. Removing any objection is key to establishing trust and receiving the sale. I have always encouraged viewers in my livestreams to inbox me any questions. This request removes the objections because the viewer can ask me a question. Communicating with my new customer accelerates the trust factor enabling me to sell to her. It is never just about ONLY the product. It is about the entire customer experience and how this makes your customer feels. I always create an enjoyable customer experience by making sure that my photos, sales copy, videos, livestream and page layout are right. As mentioned before, I encourage feedback and questions. Encouraging these things lets the customer be a participant in crafting the customer experience. When the customer can personalize his customer experience, he is more likely to buy from you. Create an undeniable customer experience by making it personal for your customer. Remember those price hagglers? When you deliver value, they go away and clear the lane for new customers who are interested in buying from you. In my eBay store, I have sold a lot of Stuart Weitzman gladiator sandals and over-the-knee boots with $40 shipping price tag. How? Because of the value that I have brought! I price my pre-owned (previously worn) Stuart Weitzman shoes 50% off what I have purchased them. That is a pretty good metric showing value. Let me use an example: The black leather 50/50 boot, a popular item, sells for $550. I am selling it for $275, 50% off. You pay $40 to cover the postal surcharge and receive the purple Stuart Weitzman box. Buying this Stuart Weitzman 50/50 boot gives the customer value in 1) authentic Stuart Weitzman, 2) the authentic purple Stuart Weitzman box and 3) USPS priority mail shipping. The customer is getting authenticity in 1-3 business days. See THAT is how you deliver value! My customer is getting her stuff the same week that she orders it. She is not on her mobile phone refreshing the screen looking for a delivery status update. The holiday season is a big time for many businesses and retailers. Here’s hoping that my three tips make it merry and bright!